Guyana will for the first time in its 50-year history as an independent nation operate with a fully liberalised telecommunications sector, with Monday’s parliamentary passage of a modern telecoms law. “This legislation will allow other companies to ensure the local market offer a variety of services and benefits…including more mobile rates, land lines and a host of other internet – related services…,” Minister of Foreign Affairs and International Trade, Carl Greenidge told the National Assembly. The coalition A Partnership for National Unity, Alliance for Change (APNU+AFC) government used its one-seat majority to successfully pass the Telecommunications (Amendment) Bill, paving the way for the end of a two decade long private monopoly on international voice and data held by the Guyana Telephone and Telegraph Company (GT&T). Approved without its requisite regulations, the Bill according to Hughes, represents a major breakthrough for the telececommncations sector. The Bill, when it comes into force, will see National Frequency Management Unit (NFMU) being subsumed under a newly created Telecommunication Agency which will assume oversight and regulation of the sector in tandem with the Public Utilities Commission (PUC). She was adamant that the legal provisions in the Bill will foster an environment that will facilitate competition in the sector, while at the same time creating a level playing field for all and sundry. Engaging the attention of the House, for the marathon session of debate, Opposition members lauded the advent of the critical piece of legislation but roundly criticised several aspects embedded in the Bill, such as the powers imbued to the Minister. Opposition Peoples Progressive Party (PPP) Member of Parliament, Joseph Hamilton said Minister of Public Telecommunications, Cathy Hughes failed in her presentation to explain to ordinary Guyanese what the bill really means for them in the area of the delivery of quality service. He lamented the poor quality of 4G Mobile data speeds and mockingly said sometimes subscribers get “2G, 1G and no G” in Georgetown two months after the service is launched. “You are paying for 4G and sometimes you are unable to get zero G so already even with the so-called upgrade we are paying for 4G and we are not getting that and if we use that as to what is to come then we are already in waters where the ordinary man and woman will suffer,” he said. The government side of the House rejected calls by the opposition for the Bill to once again be sent to a Select Committee once again and instead it was passed 33 to 32. Despite his plea for the Public Telecommunications Minister to tell Guyanese what recourse they have if they do not get the service that they pay for, she did not give any clear indications of the available remedies. The PPPC’s Irfaan Ali, in his presentation to the Bill spoke of the need to create an environment to provide incentives for local entrepreneurs looking to get into the industry. He was adamant that while in opposition, members of the APNU+AFC had complained bitterly about the wide sweeping powers of the Minister, as envisioned in a previous version of the Bill that had been tabled by the Peoples Progressive Party Civic, while in Office. “(Khemraj) Ramjattan use to say control freakism” said Ali, in reference to the phrase coined by the AFC leader while in opposition, to criticise ministerial powers exercised by the PPP/C. Ali was adamant that while the liberalisation of the sector is welcomed, Government should be wary of creating another monster given the powers of the Minister under the legislation. This charge was however roundly rejected by Vice President Greenidge, who in his presentation sought to point out that the APNU+AFC Government has in fact trimmed the powers of the Minister as against what was envisioned in the original Bill which was tabled in 2013. The Telecommunications (Amendment) Bill was initially tabled by then Prime Minister Samuel Hinds, who had deferred the matter to a Special Select Committee. That Bill was never returned to the House but Government speakers on Monday explained that the work of that Committee was not discarded and that the Bill before the House did reflect the work of that Committee. Hughes in presenting the Bill for approval had indicated that there was widespread consultation on the matter. Presentations, she said, were considered by both GT&T and Digicel, the University of Guyana and the consumer’s association of Guyana, among others. Minister of State, Joseph Harmon, in his presentation to the debate sought to debunk opposition claims of a lack of consultation. He spoke to the several refinements made to the proposed legislation by the Select Committee. He was adamant that unlike the utterances of some of the opposition members during the debate, there was consensus at level of the Select Committee with the sole incident of disagreement coming about as a result of the governance structure proposed for the Telecommunications Agency which he said was eventually resolved. Chairperson of the Select Committee that refined the Bill, Vice President Greenidge, lamented what he called the telling of ‘Nancy Story’ on the part of the opposition members in their bid to argue against the Bill. He was adamant that the powers of the Minister are not untrammeled and that the APNU+AFC coalition did in fact seek to curb the Ministerial powers as was envisioned by the then PPP/C Government. 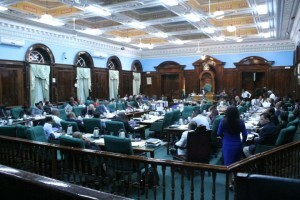 In calling for a vote on the matter, Telecommunications Minister, Cathy Hughes in her rebuttal accused the opposition speakers of being unfamiliar with the provisions of the legislation. On the matter of Ministerial powers, Minister Hughes pointed to the fact these powers are not to be exercised in isolation. She recalled too that the Bill has lagged for years while technology evolved, inherently causing Guyana as a country to lag behind the rest of the world in terms of its development on this front. Hughes said the Bill was among the more advanced in the Region, dealing with matters such as the issuance of licences, spectrum management, auctioning of spectrum, penalties and offences among others. Other contributors to the debate include PPP/C members of Parliament, Gail Teixeira, Odinga Lumumba, Gillian Burton-Persaud and Charles Ramson. Members of the House also debated and approved the Public Utilities Commission Bill, meant to consolidate related pieces of legislation in addition to additional provisions to complement the Telecommunications Bill. The PUC, according to Hughes, will continue to function as the economic regulator where necessary.